Tayson-Pierce Wines are owned by Eric and Susan Rothchild. At first impression you may assume some link between the famous French wine family but a second glance reveals a difference in spelling of the last names. Eric is from New York and made the move to the Napa Valley fairly recently. He has long nurtured a passion for wine which has passed from consumer, to hobby to a commercial producer. He was introduced to wine by his grandfather who made home wine. Then in his teens he started collecting a variety of different wines and later started keeping journals with his own tasting notes. Eric remembers being fascinated with terroir, different wine regions and wine styles. Travels took him abroad where he would visit wineries and seek out winemakers to help further his wine education. His passion for wine is noted on every bottle: “For the terroir – vines, grapes, wine – for the love of life”. Eric is an eye surgeon who divides his time between his practice in Florida and his home in the Napa Valley. He moved to the valley seeking a lifestyle change in 2005 and quickly moved into the wine industry as 2006 was the first year he made wine commercially. Such was his passion for wine that attended the UC Davis 2 year program and graduated with a degree in winemaking and viticulture. He is often in Napa checking on the wine, tasting and helping with some of the winemaking decisions. Jeff Ames is his winemaker along with Kian Tavakoli. Jeff is one of a number of underrated young winemakers in the valley. He’s been turning out top wines for his own label Rudius and several other producers. While fairly young, Kian has already built up an impressive resume of working at local wineries. He spent several years working with Cabernet Sauvignon at Opus One, then was head of Clos Du Val’s wine program and more recently ran Crushpad’s Bordeaux varietal winemaking (a custom crush winery in San Francisco). Today he spends his time consulting for a number of local artisan producers. While part of Eric’s house is bonded for commercial wine making purposes his wine is currently made at nearby winery. The focus is on limited production wines, often with single vineyard sources. 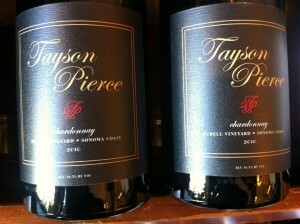 Their first vintage and release is a 2006 Cabernet Sauvignon and a 2007 Chardonnay. 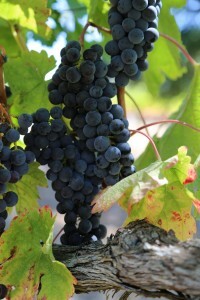 A Pinot Noir will be released in 2010. This is truly artisan winemaking, each wine is currently only available in small quantities, around 100 cases of each varietal. The 2008 Chardonnay is a Burgundian styled wine from the Alder Springs vineyard in Mendocino County to the north. This vineyard is much sought after and several other Napa producers also source its fruit. Its a vineyard at altitude with an elevation ranging from 1750 to 2700 feet. This wine saw both new French oak as well as stainless steel tanks during its aging. The wine did not completely undergo full malolactic fermentation; it reached about 65%. This wine is pale straw color in the glass. The bouquet is slightly flinty which evolves to more fruit as the wine opens. There are notes of mineralities, orange zest, honeysuckle and citrus blossom. The mouth feel is soft and rounded with just a slight viscous touch. The body is light to medium in structure – notes of melon, red apple and hints of graphite are found mid palate with just a subtle note of spice towards finish. This is a balanced wine throughout – the finish is clean and quick. The 2006 Cabernet Sauvignon is 75% Cabernet Sauvignon and 25% Merlot. The vineyard sits on an alluvial fan deposited from the nearby Mayacamas mountains and the soil is gravel loam. This wine blends four Cabernet Sauvignon and three Merlot clones. The nose immediately shows darker fruit aromas, white pepper, black spices, tar & leather. More black fruit shows than red fruit on the palate including blackberry; the flavors are layered and complex. The finish shows robust but balanced tannins which integrate well with the fruit. Both the fruit and wood tannins linger for some time along with hints of coffee bean. It is a complex wine now. However wines like this have the potential to age very well and this should develop some wonderful complexities in the bottle over the next 10 to 15 years. If you are drinking this young decanting is recommended.